I made a few more comparisons between real Plus Minus and more common stats. More common stats are in this regard stats that you can measure for individual players on a night to night basis (either advance by tracking or the typical things, like points, assists and steals). My question today is: How do common stats in general influence the outcome of a game on the defensive end? (Offensive end should be following soon). 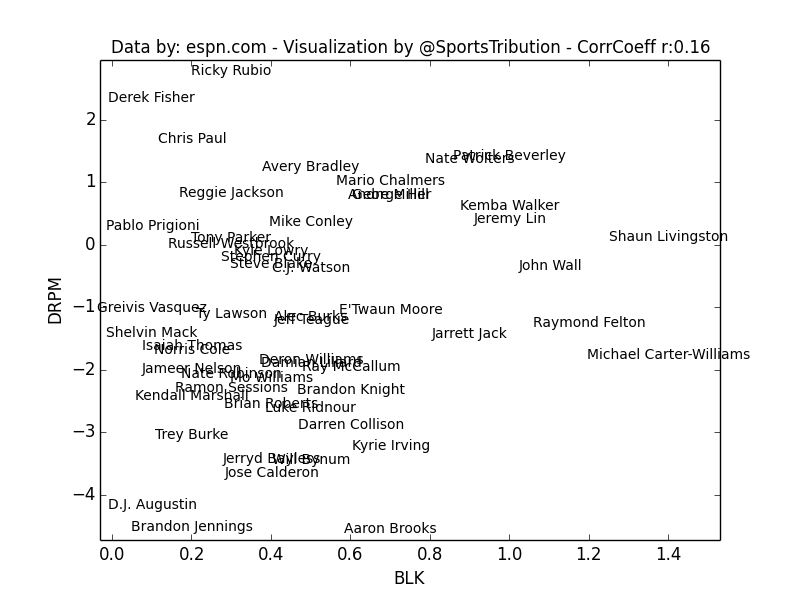 For example, if you look at one single event like a block, you would say that it certainly gives you a positive result (see Plumlee, Mason). But often, going for the block (especially as a help defender) opens rebound opportunities, so that blocks are not necessarily a good thing. So, I tried to search for correlations between those single event stats and the outcome oriented Defensive Real Plus Minus (DRPM). 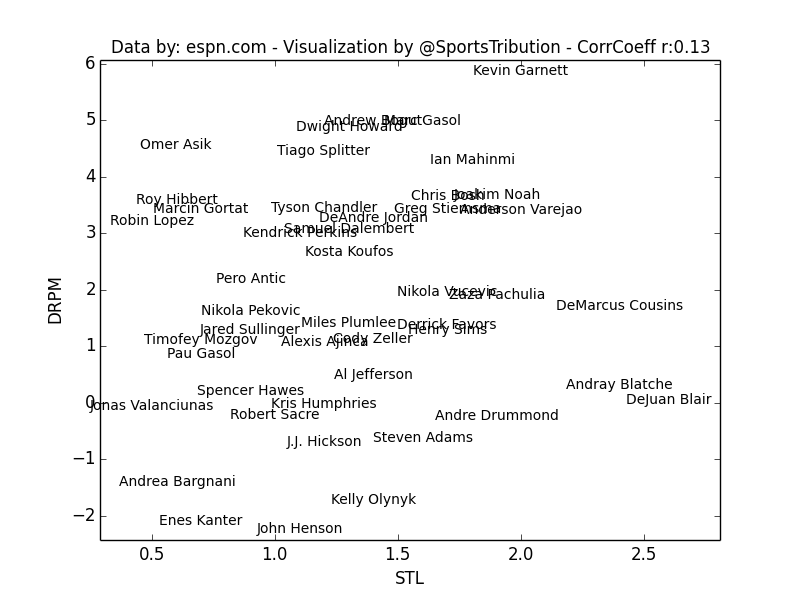 I looked at Centers and Point Guards separately, to get a good spectrum of the possible influences. All players I used played at least 41 games and 15 minutes per game. The interesting value is the correlation coefficient. As rule of thumb, you can discard any correlation with an absolute value below 0.2, while everything with an absolute value above 0.4 makes it very likely that this stat is generally influencing the outcome of a game on the defensive end. Please be aware that correlation does not imply causality. As an example: Turnover Percentage for center has a positive correlation of 0.24 with DRPM - but we would all agree that it's probably not a good idea to loose the ball more often (even though that would explain why Scotty Brooks still plays Kendrick Perkins so much). If you are interested in other stats let me know. 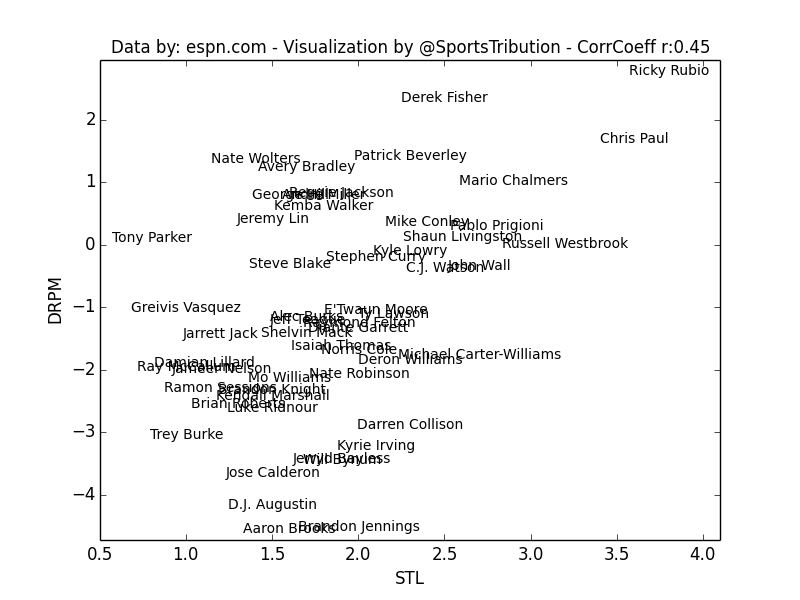 Steals are one of the stats that are strongly correlated for Point Guards and not so much for Centers. One part of it is probably that Point Guards produce way more steals than center (so there is more general weight on the stat). Another thing is that you can survive easier to be out of position if your opponent is still far away from the basket. 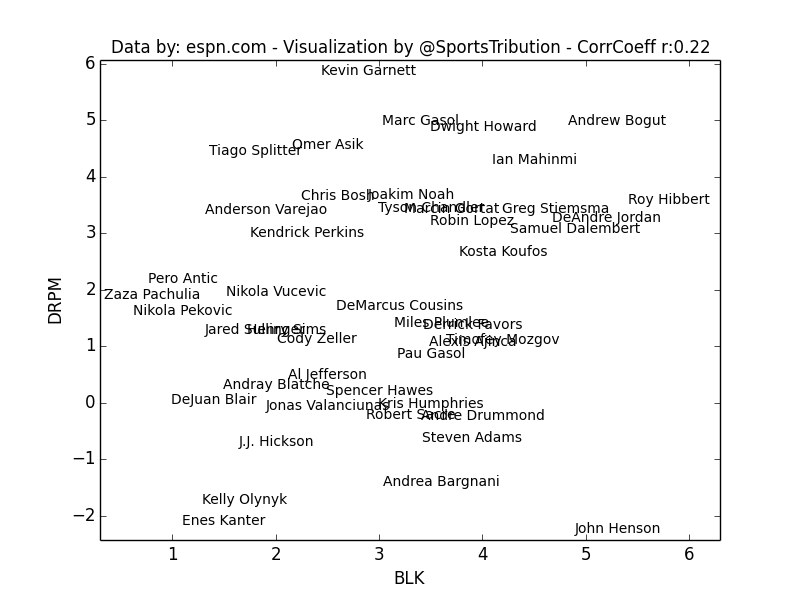 So in the big picture, steal gambling of Point Guards probably doesn't have that much of a negative effect. Opponent field goal attempts at the rim per 36 minutes: This stat shows two interesting information. 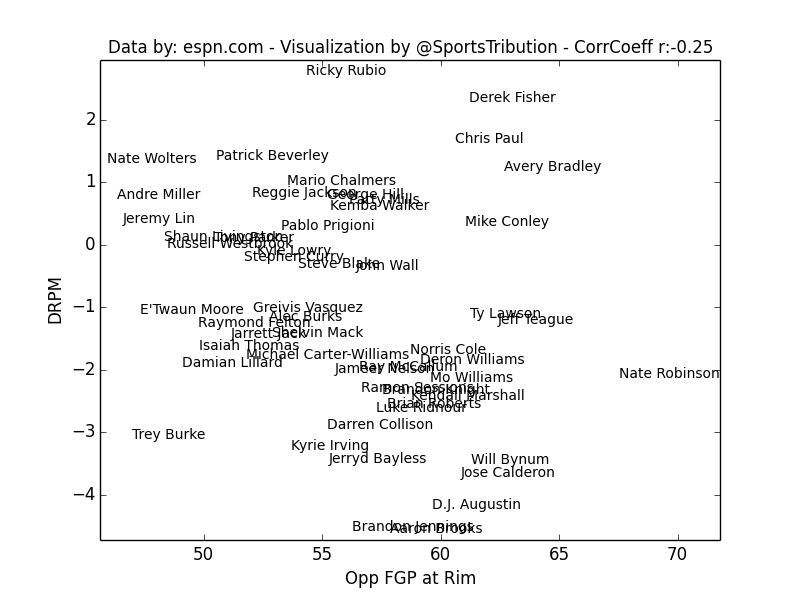 First, the number of field goal attempts at the rim for center does not correlate with DRPM. So, both schemes were you have a stationary Rim protector (like Roy Hibbert) or where your big man helps actively during the pick and roll can work similarly well (like Joakim Noah). The important thing is: If your big man is there to contest the shot, he better has an impact on it. 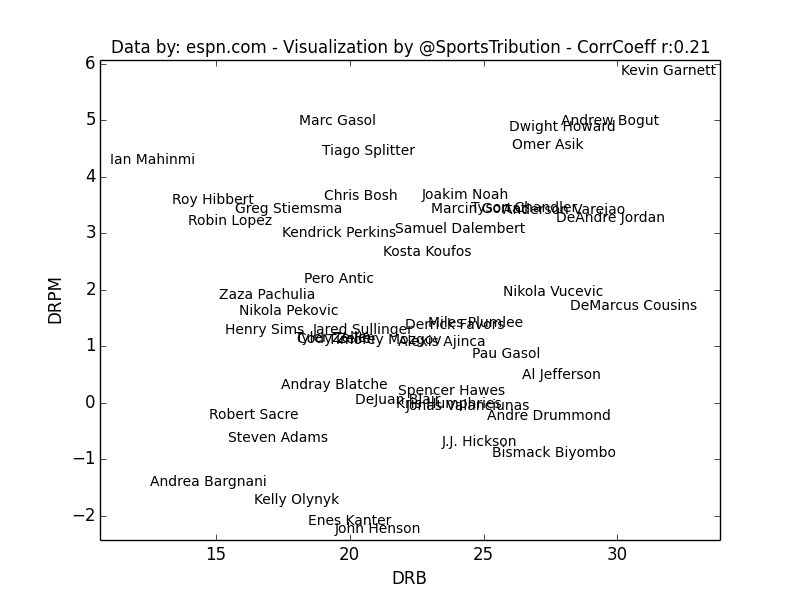 The other interesting thing is the positive correlation between FG attempts at the rim against point guards and DRPM (0.28). Before looking at RPM, I thought 'well, people probably like to drive agains Jeremy Lin'. 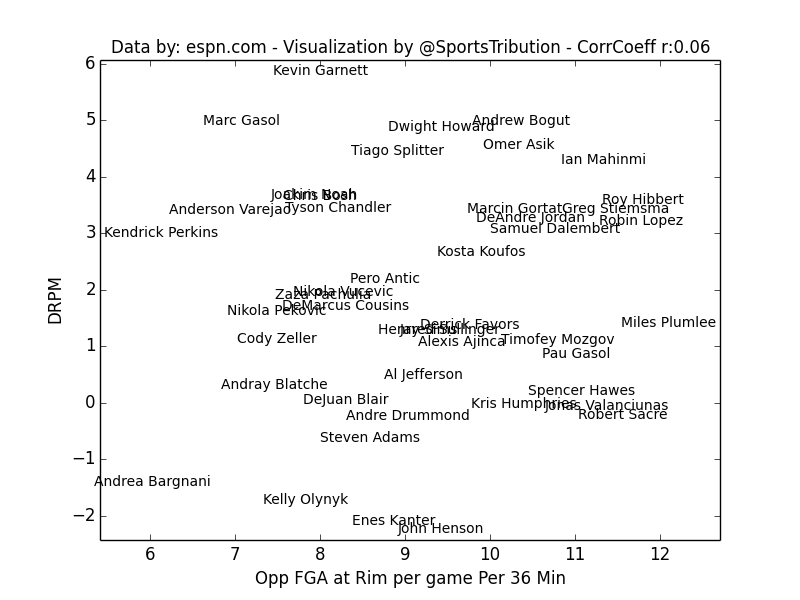 But the more you think about it - Jeremy Lin is most probably still close to the opponent while he is driving, while Brandon Jennings and D.J. Augustin might already have given up on the whole thing. The result is quite remarkable. 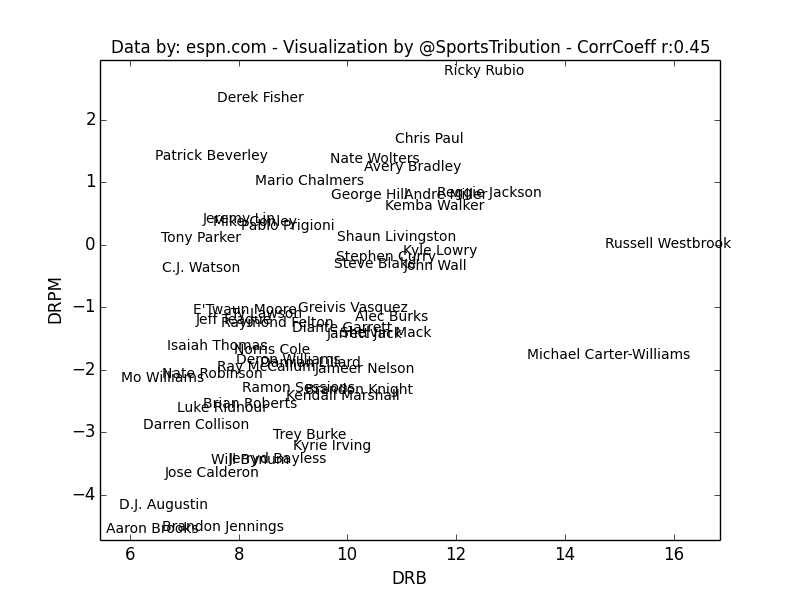 While defensive rebound percentage has almost no correlation for center (0.21), it is highly correlated for Point Guards. From my own low level experience of organized basketball1, it's probably the following explanation: If all big men get blocked out correctly, it's the small guy sweeping in that decides the battle. Or the small guy that gets the long rebound for which you cannot even box out correctly. Let me know if you have a better explanation. Pretty cool stuff here but DRPM if it's from ESPN is influenced by your defensive stats so it's not really just a correlation between outcome and stats or am i wrong? I liked the Jeremy in mention, too.